Getting to the San Juans is not as hard as you might think. You might even say the adventure starts before you get here. From float plane flights to high speed ferries you can get from Seattle to Friday Harbor Marina dock for as little as $150 dollar round trip. 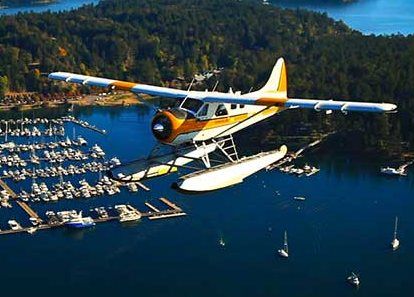 Daily, year-round seaplane service is provided from Seattle's Lake Union to Lopez Island, Orcas Island and San Juan Island in Washington State, as well as to Victoria, BC. Limited year-round service is also provided from Lake Union to the Canadian Gulf Islands and the Saanich Peninsula. Seasonally (May–September), daily seaplane service is provided from Kenmore Air Harbor to more than 30 destinations in British Columbia, including Big Bay, Campbell River, Cortes Island, Desolation Sound, Nanaimo, Port Hardy, Port McNeill, Quadra Island, the Sechelt Peninsula, Sonora Island, and Refuge Cove. Our high-speed Clipper catamarans provide a relaxing and scenic cruise experience. Travel seamlessly between Seattle and Victoria, on a less than three-hour ride through the Salish Sea. Skip the driving and get ready for an easy and convenient border crossing within our terminals. We’re also the only whale watching service that lets you travel direct to San Juan Island from Seattle. As you wind your way through the islands, you’ll have a chance to meet orca, minke and humpback whales! Seattle to Friday Harbor flights are available through our sister company, Friday Harbor Seaplanes. Both Northwest Seaplanes and Friday Harbor Seaplanes are conveniently located on South Lake Washington just minutes from downtown Bellevue, downtown Seattle and the Sea-Tac Airport. The Friday Harbor flights with Friday Harbor Seaplanes are the only non-stop seaplane connection from Seattle. San Juan Island is only 50 minutes away!